Beginning at 10 p.m. tonight and continuing through system closing on Sunday, shuttle buses will replace Orange Line trains between Court House and Foggy Bottom and Blue Line trains between Pentagon and Foggy Bottom to allow for rail fastener renewal, insulator replacement and sludge removal from the tunnel beneath the Potomac River. 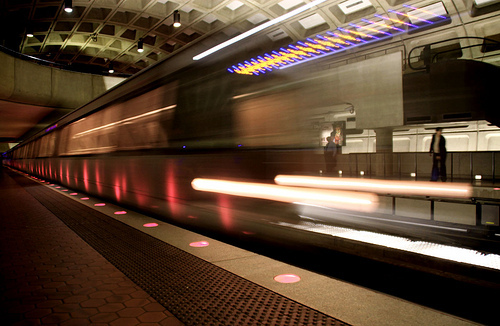 Two stations — Rosslyn and Arlington Cemetery — will be closed. Orange Line trains will operate in two segments: between Vienna and Court House every 20 minutes, and between Foggy Bottom and New Carrollton at normal weekend service levels. Blue Line trains will operate in two segments: between Franconia-Springfield and Mt. Vernon Square via the Yellow Line bridge at normal weekend service levels, and between Foggy Bottom and Largo Town Center at normal weekend service levels.